Sentry – Vetter Joint Clinical Trial Delivery System | Sentry BioPharma Services, Inc.
Safeguarding the health of clinical trial participants and the progression of trial results demands strict adherence to protocols. A disciplined approach to project management adds value within the constraints of client needs, including time and budget. 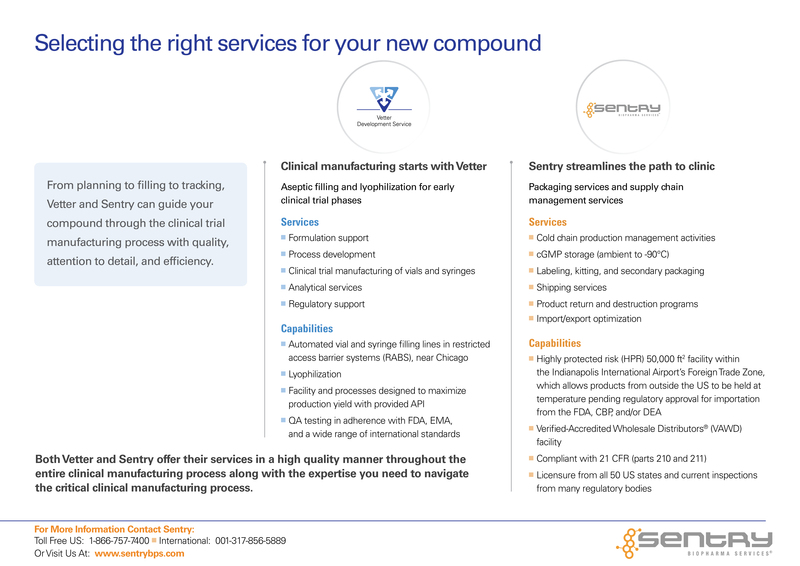 As a continuation of Sentry’s CMO extended services, Sentry BioPharma Services and Vetter Development Service USA (Vetter) have announced their combined services offering to support new drug development from compound through clinic trials. 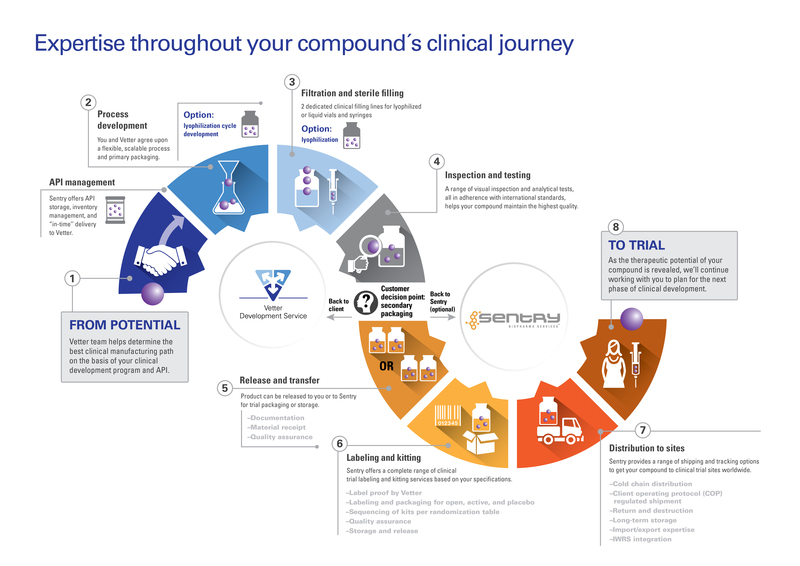 From planning to filling to tracking, Vetter and Sentry will guide your compound through the clinical trial manufacturing process. This entry was posted in News Post and tagged -90°C storage, ambient storage, biotechnology, clinical trial manufacturing process, clinical trial materials, contract manufacturing organizations, domestic distribution, Drug product destruction, Drug product returns, Drug product shipping, drug product storage, foreign trade zone, GMP compliant, GMP storage, import/export, new drug development, pharmaceutical, Pharmaceutical cold chain, pharmaceutical compound, pharmaceutical kitting, pharmaceutical labeling, pharmaceutical secondary packaging, Sentry BioPharma, Sentry BioPharma Services, worldwide international distribution on January 25, 2016 by Sentry.